Mr. Kaas is a member of the firm’s Litigation, Alternative Dispute Resolution, and Family Law, sections. Mr. Kaas’ litigation and settlement practice is focused on helping individuals and businesses resolve disputes and solve problems in wide range of litigation matters including, business and commercial disputes, real property, trust disputes, torts, contract disputes, general civil litigation, and complex commercial litigation. Mr. Kaas represents clients in state and federal courts throughout Utah. 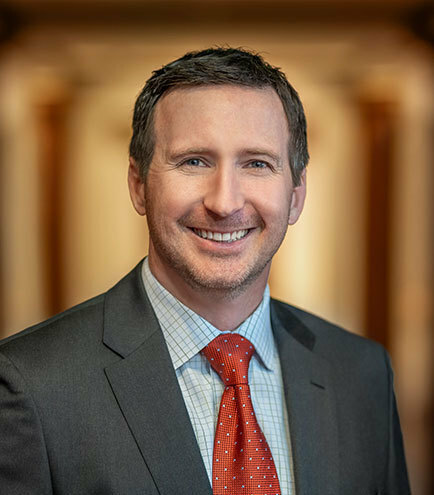 Mr. Kaas works closely with his clients to assess claims, develops strategies to resolve all forms of litigation, and to advise clients on business decisions and plans that pose litigation risks. While Mr. Kaas has significant litigation and trial experience, he also understands the value and benefit of alternative dispute resolution. He understands that litigation is not always the best course of action for his clients and he works closely with his clients to analyze their needs and desires and to develop a course of action to best further those needs and desires. In addition to his litigation practice, Mr. Kaas has a settlement practice that is focused on the settlement of pattern litigation. Mr. Kaas’ family law practice focuses on family law issues such as divorce, child support, alimony, custody, protective orders, modification orders, and paternity. Mr. Kaas helps clients through times of significant family transitions through both the court process as well as mediation. In all of his cases, Mr. Kaas is committed to ensuring that his clients fully understand the legal process and to providing his clients with the counsel, information, and resources they need to feel comfortable with the process and to make the best decisions for them.